Hi guys, and welcome to a new Top Ten Tuesday! Today’s a freebie, so I thought I’d take this time to talk about some of my all-time favorite fictional character crushes! One of the most important things for me when reading a book or hearing a story are the characters. I crush on fictional characters all the time. In fact, if I don’t fall in love with any of the characters, chances are I don’t like the book as much, no matter the writing or plot. I NEED to feel things for the characters. I NEED to fall in love with them for some reason. I NEED to be thinking about certain characters long after finishing the book or turning off the tv. 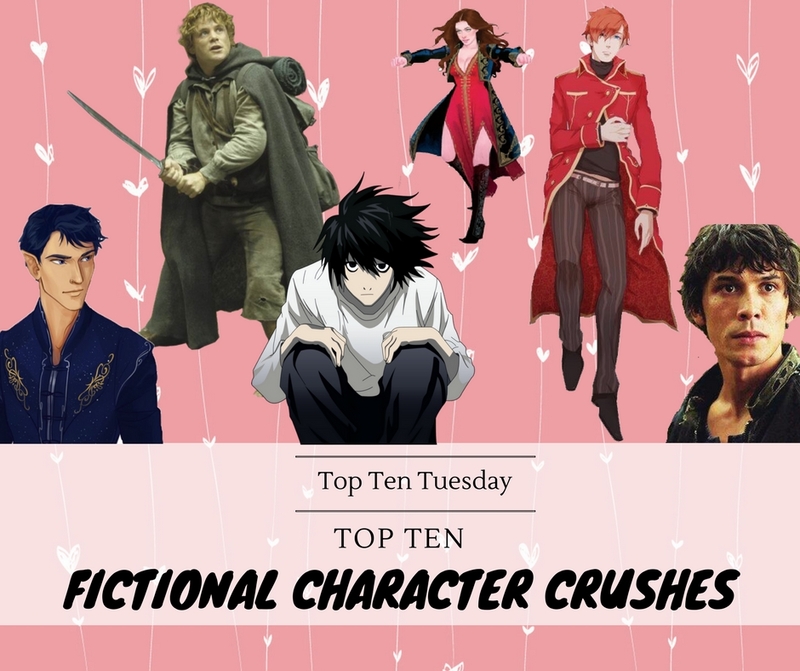 So, while this list is soo much longer than ten (but hey, we’ve got to start somewhere), I give you a list of the first ten characters that came to mind when I thought about fictional crushes. This list will contain characters from books as well as from TV or movies. And, to limit myself a bit more, I chose only one character per series, though this was quite hard in some cases as well. Ah, Samwise the Brave. After Pacey, Samwise is definitely my BIGGEST fictional crush to date. I fell in love with his kindness, his loyalty, his friendship. His scenes with Frodo make me cry every time and I just adore this little hobbit so, so much. Tall, dark and mysterious, that would be the first impression I had of Rhys. But I was immediately intrigued by the High Lord of the Night Court and sensed there was so much more to him than meets the eye. And I was right. He’s loyal to his people, brave, respectful, kind and just overall such a good guy and I love him so much. This is one series where I had A LOT of trouble picking just one character, because I fell in love with most of them. Celaena, Dorian, Chaol, Lysandra… I crushed on every single one of them. But if I have to choose, Manon is my queen. The bloodthirsty witch is such a badass and I love her character development throughout the series. I love her devotion to the Thirteen, I love her interactions with Dorian, I love her love for Abraxos and I just adore her and could read about her all the time. I recently became pretty much obsessed with Death Note and may have binge-watched the anime, drama and movies in about 2 months time. During that time, I fell in love with the character of L. He’s a genius who is the top three best detectives in the world, he sits funny, hardly ever wears shoes, eats only sweets and is not very social. BUT he’s cute and adorable and I LOVE HIM <3 He also shares a birthday with me (October 31st), so obviously this fictional crush was just meant to be. My favorite king of one-liners. I can’t talk about Nikolai without resembling the heart-eyes emoji. I just can’t express my love for this character enough. He’s brave and loyal and so incredibly funny and he deserves the world. Still hoping for a Nikolai spin-off to happen! Talking about spin-offs, how about a Nina spin-off? She’s also a character who deserves the world and I adore her. Though I crush on pretty much every character from the Six of Crows duology (How come so many amazing characters exist in one book? The sheer genius of Leigh Bardugo I think), I chose Nina because she is just amazing and I adore her. The Grisha Heartrender is badass, kind, self-confident and lovable and I swoon over her love for her friends AND food. Bellamy Blake is my current tv crush. He’s a flawed character for sure, but I just love his love for his sister, his people and his devotion to Clarke (Yes, I admit, I’m a major Bellarke shipper). But while I want him to find his happiness with Clarke, I can still crush on him myself can’t I? I read the first two books in this trilogy this month and fell in love with this little Kitsune. Shiro is a mischievous fox-spirit who is cursed with massive memory loss, but still remembers how to be witty and how to flirt. Naturally I fell in love with him right away. The Shades of Magic series is an amazing series that I only discovered this year but I immediately fell in love with the story, with the world AND with the characters. Yes, note the ‘S’ in characters… It was hard to choose a favorite between Kell, Lila, Rhy and Holland because I adore each and every one of them. But I went with Kell simply because he brings out my heart-eyes the most. I love his seriousness, I love his brotherly bond with Rhy, I love his coat… There’s plenty of reasons to fall in love with Kell! what are some of your fictional character crushes? do we have any in common? Bellamy Blake ??? I’ve actually been in love with Bob Morely ever since he was on an Australian soap when I was like 15 ?, so it was really weird at first to see him get so famous, ahaha. I love Nina and Kell too ♥ Great list!! Haha yes, I love those books so much it is hard to make a list without mentioning them 😉 But really, they do have some amazing characters! And it’s so true that characters make or break a story. Haha, yes that's what I like so much about Sarah J. Maas and Leigh Bardugo's books: there are SO MANY amazing characters to fall in love with 🙂 Rowan, Aelin, The Darkling and Kaz - I love them all so much as well! I love so many of these characters too. So a big yes from me for: KELL, Bellamy (I mean, look at Bobby Morley… honestly), Nina, Nikolai, Sam, and Pacey. I love the picture you put with Nikolai, who is that? And the woman you used as an example of Nina is absolutely stunning. Haha, yes, Bob Morley is just swoon-worthy all by himself 🙂 I’m actually not sure who exactly is in the Nikolai picture – I found it on Pinterest by looking for Nikolai Lantsov but there was no name… But I found it too fitting not to use 🙂 Same for Nina. So much YES to Rhysand and to Bellamy. Great list! Ohhh I love this list idea! Sam was the best!! He’s the only one I “know” so far. I have a bunch of these books on my TBR list but haven’t gotten to them yet. I’ve never actually watch Dawson’s Creek. haha! I think I’m the only one ever that hasn’t lol! YES, Nikolai and Nina <3 Leigh Bardugo definitely has the power to create so many amazing characters! Ahhh I love Pacey. He’s such a great character! BWWAAHHHAAAHA L AND LIGHT ARE MINE STAY AWAY I MEAN I TOLD YOU OF DEATH NOTE SO I AM THEIR RIGHTFUL OWNER LOLOL *cackles* ???? btw great list Lindsey! Ahh, some of these I know (WELL!!!) and others not at all. I REALLY need to read Bardugo. I don’t even know why I haven’t yet. Manon and Rhys – Oh my gosh. I am a total diehard SJM fangirl right now and those two are AMAZING. I cannot, cannot, cannot wait to read more of them both this year and will be picking up ACOTAR next month for my rereads in prep for ACOWAR! I haven’t watched the 100 since end of Season 2 but I really need to get back to it!!! Ah, Leigh Bardugo has a gift to create these amazing characters, so I hope you’ll fall in love with them as well when you get to them! OMG, I’m a total SJM fangirl as well! Ah, that’s such a great idea to re-read ACOTAR in preparation for ACOWAR! I hope to do that as well, or at the very least only re-read ACOMAF.